Last December in St Stephen's Green. 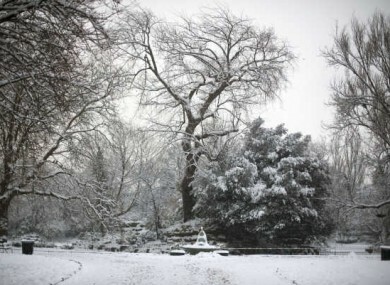 IRELAND WILL EXPERIENCE less snow this year compared to last winter but January will still be colder than normal, says long-range forecaster Peter O’Donnell. According to the climatologist’s forecast on Irish Weather Online, late October will be a lot colder than the past three weeks have been but we could get another mild spell in the early part of November. Snow may return in the later part of next month but it will not be as “dramatic” as last year, says O’Donnell, adding that the severe cold will not continue through the whole of December. According to the weatherman, the days leading up to Christmas will be “rather cold” but between December 25 and New Year’s Day, there will be a milder interval. However, things could start going downhill from there with O’Donnell calling January “the” month of the winter. His model forecast suggests some much colder than average weather through most of the month with snowfalls possible, especially in Meath, Dublin and Wicklow around January 8. “The greatest depth of cold, suggesting higher pressure building up from the east, should then come a little after mid-January,” added O’Donnell. There may be some residual snow in the first days of February but, according to IWO, the rest of the month will be milder. In fact, February could be quite “spring like” with temperatures “well above normal”. This could lead to flooding from the thaw and melt. However, March could see a return to winter conditions with temperatures cooler than usual. Winter 2011-12 looks like being quite an active winter and not lacking in wintry weather types, although not entirely dominated by them either. Readers in more isolated and upland locations might be well advised to have extra supplies on hand at a fairly early stage of the winter in case the early opportunities for cold dig in, but we think your main challenges will come in January this year. Email “January will be the coldest month this winter - forecast”. Feedback on “January will be the coldest month this winter - forecast”.